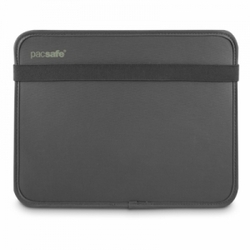 PacSafe RFIDtec™ 300: Keep your tablet right where you need it, when you need it with this convenient, multifunctional padded sleeve. With several different positioning options, the sleeve changes to fit every occasion. The extra RFIDsafe™ blocking rear top pocket gives you easy access to your passport and travel documents whilst providing protection against would-be identity thieves.